The potato chip was first invented in 1853. 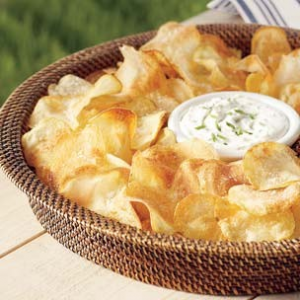 Dips for chips first become popular in the 1950s serving as finger food. Choices of chips can be tortilla chips, potato chips, or pretzels. It takes 10,000 pounds of potatoes to make 3,500 pounds of potato chips. Dips can be salsa, guacamole, cheese, hummus, olive dip – anything can be made into a dip. Hummus, as part of Middle Eastern and Mediterranean cuisines for centuries, did not appear in the United States until after World War II. The first chip-and-dip set was made by glass and this two-bowl set was advertised as useful not only for potato chips, but also for salads, floral centerpieces and seafood snacks.. The Oxford English Dictionary added the term “dip” in print, in 1960. 1699 John Bartram was born. American naturalist and explorer, considered ‘father of American botany’; established a world renowned botanical garden in Philadelphia in 1728. 1857 Fannie Merritt Farmer was born. American culinary authority, and author of the 1896 edition of ‘The Boston Cooking School Cook Book‘ which became known in future editions as the ‘Fannie Farmer Cook Book.’ Director of the Boston Cooking School, and founder of Miss Farmer’s School of Cookery. She is often cited as the first cookbook author to introduce standard measurements. 1880 A patent for a glass milk bottle was issued to Warren Glass Works. 1912 The Dixie Cup was developed by Lawrence Luellen and Hugh Moore. Its original name was the ‘Health Kup,’ changed to ‘Dixie Cup‘ in 1919. The name came from a line of dolls made by the Dixie Doll Company. 2008 R.I.P. Al Copeland, the founder of Popeye’s restaurant chain. Reblogged this on My own little corner. I like the unsalted varieties of pretzels and chips. (Though many a times, I can’t resist the bag of sour cream and onion potato chips calling out to me.) I realize that unsalted chips doesn’t sound appealing to most reading this, but I suggest giving it a try next time you have chips and dip. With the flavors in the hummus, ranch dip, salsa, etc., you won’t miss the salt in the chips, and you’ll have made a healthy choice by cutting back on sodium.